A study was conducted to evaluate the effects of the growth retardant Cycocel application in the growth and development of poinsettia (Euphorbia pulcherrima) ‘Freedom Red’. Cycocel was applied by spraying plant shoots at the concentrations of 1000, 1500, 2000, 2500 ppm. The increase in cycocel concentrations reduced plant height, leaf size, internodal length, plant spread and the number of flowering plants. All cycocel concentrations resulted in an ideal potted plant height. The optimum spray concentration of Cycocel used to obtain compact and uniformly flowering plants under tropical West Java environment was 1000 ppm. Adams, C. R., K.M. Bramford, and M.P. Early. (1995). “Principles of Horticulture”. 2nd ed. 204 pp. Butterworth Heinemann. Faust, J.E., Korezynski, P.C., and R. Klein. (2001). Effect of paclobutrazol drench application date on poinsettia height and flowering. HortTechnology 2, 557-560. Hampton, G. (1988). The effects of growth retardant soil residues on succeeding agricultural crops. New Zealand Journal of Experimental Agriculture 16, 167-172. Hartley, D.E. (1992). Poinsettias In: “Introduction to Floriculture” (R.A. Larson, R.A., ed), pp. 306-330. Academic Press Inc., San Diego. Kessler, R. (2005). Poinsettia Commercial Greenhouse Production. http://www.ag. auburn.edu/hort/landscape/poinset.htm. [14 September 2015]. Krisantini, Aisyah, S.I., Sukma, D. 2014. “Dasar Budidaya Tanaman Hias Pot”. 55 pp. Deepublish, Yogyakarta, Indonesia. Niu, G., Heins, R., and Carlson, W. (2002). Using paclobutrazol to control height of poinsettia ‘Freedom’. HortTechnology 12, 232-236. Vince-Prue, D. and Gregory, P.J. (2015). Gardening in the greenhouse In “Science and The Garden, The Scientific Basis of Horticultural Practice” ( D.S. Ingram, D. Vince-Prue, P.J. Gregory, eds), p. 203-219. Royal Horticultural Society and Blackwell Science, U.K.
Rademacher, W. (1995). Growth retardants : biochemical features and application in horticulture. Acta Horticulturae 394, 57-73. Youssef, A.S.M., Abd El-Aal, and M.M.M. (2013). 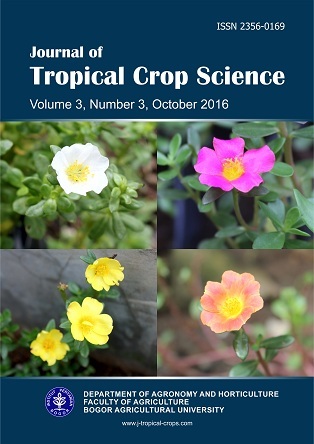 Effect of paclobutrazol and cycocel on growth, flowering, chemical composition and histological features of potted Tabernaemontana coronaria Stapf. Journal of Applied Sciences Research 9, 5953-5963. Yulistyo, H., Sukma, D., and Krisantini. (2009). “Perbandingan Budidaya Poinsettia di PT MJ Flora, Indonesia dengan Metrolina Greenhouses, Amerika Serikat”. Unpublished Report. 51pp. Institut Pertanian Bogor, Indonesia.